Was that the Silver (SLV) Reversal? HomeBusinessWas that the Silver (SLV) Reversal? In the big scheme of things this is a relatively small market, and as we outlined last week it’s getting immensely crowded as volume in the silver ETF (SLV) actually surpassed the SPDR S&P 500 ETF (SPY) as the most traded vehicle, a week ago today. 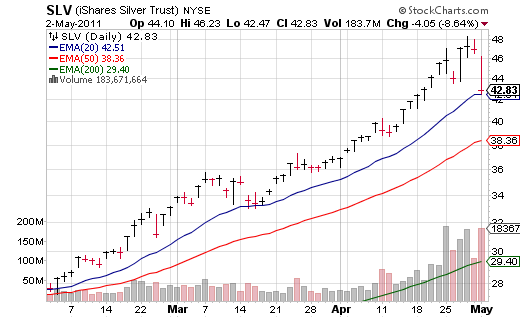 The next few days will be interesting as the ETF has dropped exactly to its 20 day moving average, after a ‘gap down’. Interestingly this happened after essentially brushing against an all time high from a few decades ago (massive double top?). Like I said last week I would prefer to see a day where silver shot up, and then reversed heavily during the session and broke to a new low to call ‘a top’, but with so much of the world’s activity happening nowadays in thinly trading afterhours I suppose it is appropriate that the majority of this move happened in the overnight session as well. Expect many eyes to be on this one, as many new silver “investors” have been minted (pun intended) in the past few weeks.